It’s precisely this optimism that inspires two introverted, awkward and overly polite characters to fall into something close to love in director David Yates’s HBO film The Girl in the Cafe penned by Four Weddings and a Funeral scripter Richard Curtis. Quickly into the film we meet Bill Nighy’s Lawrence, a fifty-seven year old workaholic whose only luxury apart from his lofty position working alongside the Prime Minister and others in Britain’s government is deciding how many packets of sugar to stir into his tea on the very worst of days. In a crowded café where every table is occupied, he asks the young, beautiful yet approachable Gina (Kelly McDonald) if he can sit down at her table. Cautiously seated diagonally from one another, they fluster for the right words as they politely bond over shared opinions on striped pajamas and other meaningless bits of everyday life until they feel comfortable enough to sit directly across from each other. Like many of us less bold and equally shy individuals would do, one senses that although they’d long to chat even further, neither knows how to do so and when Lawrence realizes he’s going to be late back to the office, he begins to walk away before taking a chance to ask Gina to lunch. Nervous and rambling, Gina reveals that she has nothing to do with her time (which let’s face it, would’ve ended most “dates” right there here in the states) and they plan to meet up in a few weeks. A few more earnest and polite dates follow until Lawrence, after phoning her a few times in one day (which again would’ve probably caused most of us Yanks to back away) takes an even bigger risk in asking her to accompany him to the G8 Summit in Reykjavik, Iceland. Much to the gentlemanly Lawrence’s surprise and although he’s never actually made any attempt to actually kiss or touch her by their third date (which would never happen here as well), Gina accepts the offer to travel but after they realize that they’re going to be forced to share a room, the two polite and confused souls try to over accommodate one another by debating over who gets the bed or couch while they vow to stay away from the intimate quarters as much as possible. Intriguingly, nothing is made of the age difference between the two as they are visibly May and December with at least twenty to thirty years between them and while, normally one would doubt their true motives with assumptions towards “sugar daddy” or “mid-life crisis,” it just seems like in Girl in the Café that the two feel genuinely pulled to one another. Moving away from just a true romance, the film becomes more political with each successive minute after they land in Reykjavik and Lawrence, who we assume had gotten into government with an Atticus Finch or Capraesque wish to change the world and help mankind is becoming more and more disenchanted and disheartened by the proceedings that are making his quest to help fight global poverty overshadowed by matters of economics and defense. Couple this with Gina’s newfound passion for speaking out and reading all of the research that the defeated Lawrence brings home which recounts the 30,000 children dying unnecessarily each day from extreme poverty and the two begin to see their budding and sincere relationship tested by political actions and decisions in a land that feels as isolated and introverted as the characters themselves. Winner of the Best Made-For-TV award as well as accolades for the screenwriting and McDonald’s performance, Curtis wrote his astute, intelligent and quietly powerful films especially for the two stars who were also nominated for Golden Globes. 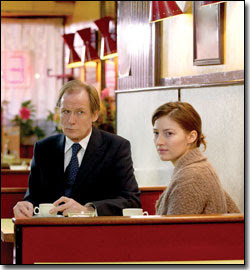 Although I’d always been a fan of the gifted McDonald, especially since her performance in both Gosford Park and Two Family House, I was also pleasantly surprised by Bill Nighy, who in stark contrast to his wild lothario rock star in Love Actually (also written by Curtis) proves to be a fascinating and sensitive actor that’s delightful to watch. Available on DVD, The Girl in the Café may also be found playing sporadically on its home network of HBO.